As much as I adore makeup (and I really, truly do) over the past couple of years, I’ve realised just how important skincare actually is. After all, you can’t out-lipgloss bad skin! So, as I’ve learnt more about what works for my skin, I’ve discovered some really amazing skincare brands. One of these is Själ . I’ve featured some of their products on here before, as I just adore the way the brand mixes ideas from Ancient Eastern Medicine with cutting edge science. So, you can only imagine how excited I was when I got to interview the brand’s terribly glamorous founder Kristin Petrovich! LL: What prompted you to create your own skincare line? What were your aims for Själ when you founded it? KP: My mother and I were looking to create something extremely simple and effective for today’s consumer; multi-tasking products that would produce results and that would not plateau on the skin but rather to become a staple or ‘go to’ product in ones bathroom cabinet. It was our goal to create a well-edited, straightforward line using the highest quality ingredients free of harsh chemicals and fillers that visibly restore, nourish and reversed signs of aging while working to detoxify, balance energies and protect the skin from the damaging effects of the environment, stress, fatigue and travel. LL: What attracted to you the idea of fusing Ancient Eastern medicine with modern technology? What do you think can be gained with combining the two? KP: We always practiced both Eastern and Western medicines. Eastern medicines for prevention, relaxing and re-balancing energy and Western for general health and advanced science. For us, the integration of the East and the West was the natural course to take for the brand, we found that ancient medicines coupled with the latest advances in bio-technology and anti-aging technology proved for the most balanced, effective and efficacious products. We felt this complementary approach provides for a truly comprehensive, well-rounded anti-aging regimen. 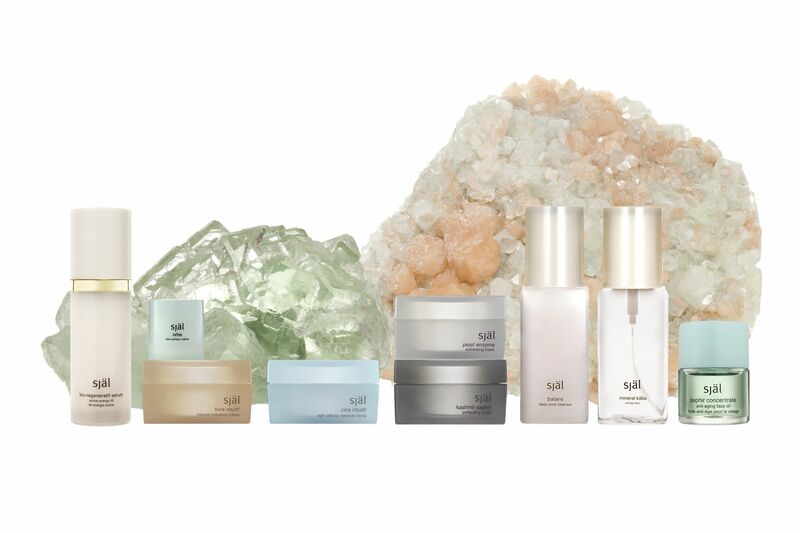 LL: Sjal skincare products are charged with precious minerals. What difference does that make to the overall product as well as to skin? How are the products charged? KP: All matter has energy, however, gemstones and minerals naturally emit a higher frequency or energy. Higher frequency or energy is positive for our cells and ultimately for our health. Själ products are ‘charged’ with precious minerals including gold, silver, copper, platinum and germanium in both liquid and solid form. Known as electro-stimulants, these minerals function as semi-conductors increasing cellular productivity, performance, repair and penetration while leveraging the effects of the other ingredients. We use gemstones and minerals in different ways: powder, colloidal, elixir and frequency. Powder is ground gemstones, colloidal is a liquid suspension with nano particles and frequency or an elixir is when a stone is programmed or blue printed into the substance, it can also be done through osmosis. Själ uses a platinum peptide complex with targeted platinum delivery system, this platinum delivery system was taken from a bio-tech cancer drug research group as they are using platinum and other precious minerals (which naturally vibrate at a higher frequency) to directly target weaker cells. They incorporated this platinum delivery system with peptides to help target anti-aging. In addition to precious minerals, själ incorporates gemstones such as diamond, blue sapphire, ruby, amethyst, citrine, and tourmaline, which promote increased cellular energy, microcirculation and clarity. Just like minerals, different stones have different properties. For example, the sapphire is known for clearing, amethyst is known for healing, rose quartz is known for calming and circulation, malachite is known for protection. We use gemstones and minerals that we feel are universally beneficial and complementary to our products. This elevated frequency emitted from gemstones and precious minerals helps direct energy to specific areas of need, constantly adapting to your skin under any condition, allowing for maximum performance and benefits. LL: The products feel incredibly luxurious to use. Was that an important element in creating them? KP: Yes, of course, the entire experience of the product is important. From texture, to slip, to absorbency to overall feel on the skin. We work with the purest ingredients and bases as we want the product to feel luxury as though its your your own skin, we want allow for the product to absorb so it can do its job. LL:What do you think are the most important elements of an effective skincare regime? 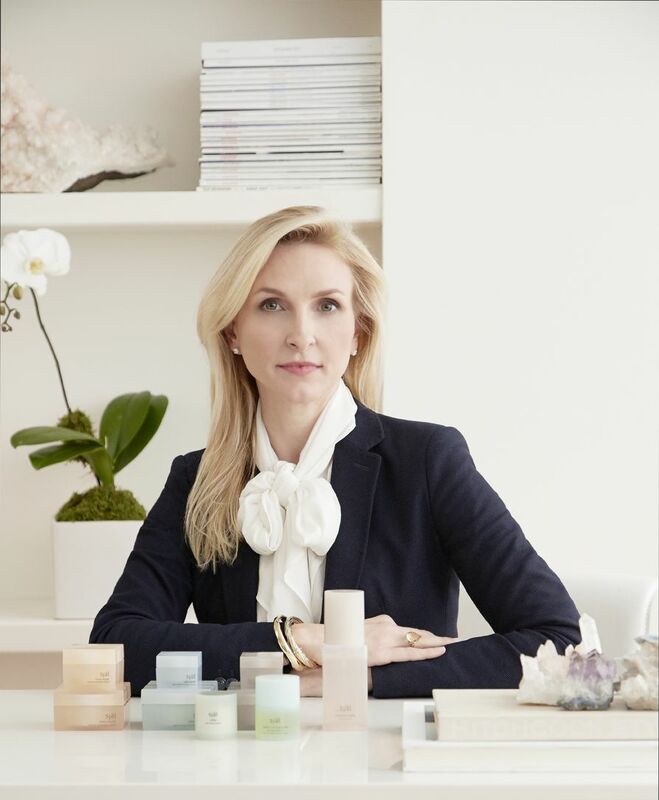 KP: I think creating a well-round product as opposed to something one dimensional, the modern consumer does not have time for 15 serums, things need to be simple yet comprehensive with a multitude of minerals, proteins, vitamins, peptides, amino acids, botanicals, algae, etc. Products need to be balanced yet effective. LL:Your newest product, the Bio-Regeneratif Serum is absolutely amazing to use! How did you decide on the Malachite and gemstone blend? KP: We are constantly being bombarded with EMFs and Radiation, we are electrical beings affected by electromagnetic pollution (mobile phones, computers, power grids, etc). Electromagnetic pollution creates oxidative stress. Stress can lower our frequency and energy field making us more susceptible to illness and disease. As gemstones naturally vibrate at a higher frequency they are healthy for our skin and body. Malachite, for example, acts as a shield against EMFs and Radiation. It protects the skin externally by balancing electrons and internally by stimulating the production of glutathione, our body’s most powerful detoxifier. Our gemstone blend helps to provide enhanced cellular energy, microcirculation and skin clarity. LL: How important do you think a serum is in your skincare regime? Should it be used once or twice per day? KP: The most important part of a regimen as they can make the greatest impact, I always suggest twice per day. LL: What’s next for Sjal? I just wanted to say a huge thank you to Kristin for taking the time to answer my questions! I just find it so fascinating to learn about brands like Själ and see how individual they truly are! I’ve also been fortunate enough to try out the new Bio-Regeneratif Serum, and it’s amazing! So keep an eye out for my review!